Fill, Drink, Wash, Repeat - The classic To Go Cup becomes a reusable everyday cup. Purr-fect for iced beverages! 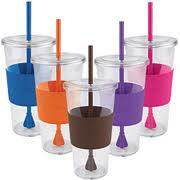 This cold beverage cup looks like a disposable one, but its reusable so it reduces waste. Featuring an easy-sip straw and secure drink cover, this BPA-free cup is the ideal way to take your cold beverages to-go. Top rack dishwasher safe. This mug will fit under most Keurig Brewing Systems, including the Keurig Elite B40 Home Brewer, the Keurig Special Edition B60, the Keurig Platinum B70 Home Brewer and the Keurig OfficePro and B155 Home Office Brewers (the Copco On-The-Go Cold Beverage Mug measures approximately 7 inches in height, so the drip tray on your Keurig Brewer must be removed). Brew directly into your Copco On-The-Go Cold Beverage Mug (over ice) from a Keurig Brewing System, season to taste and go.